The Master Plan was the project of a remarkably effective program of constructive citizen participation over a period of several years. It guided the design for a total new "balanced" community with 2000 new dwelling units for approximately 10,000 persons on a 137 acre site, long known for its substandard housing and living conditions and resulting social unrest. Dwelling units were planned to offer subsidized rental, market rental, and purchase opportunities under related HUD programs and sized from efficiency to five bedrooms. With strong community participation at all levels of socio-economic and physical planning, the overall Master Plan contained direction for all dwelling units plus new streets, utilities, parks, playgrounds, community center, shopping area, schools, and churches with emphasis on creating a "village-like" scale. The site was rocky, barren and windswept series of hills, containing a residue of 800 substandard dwelling units and WWII barracks, with existing utility systems and vehicular and pedestrian communication systems completely obsolete and inadequate. The unsightly conditions were minimized by the grandeur of sweeping views taking in the City of San Francisco and the Bay. 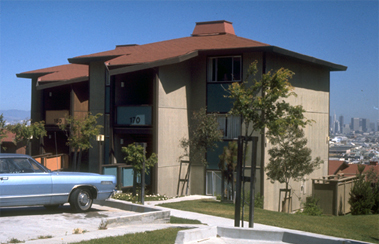 Over 200 housing units were completed from designs and plans prepared by Aaron G. Green Associates, as well as administration of their construction contract. The Master Plan received the Honor Award from HUD for Urban Design Concept. From HUD's news release, "The phased residential upgrading of a low income district represents a thorough and aggressive approach to solving the most critical problem in city design." Design Objectives: Develop a spirited, colorful, humane, informal, and inviting architectural vocabulary of domestic scale with which the occupants could feel comfortable and proud of their planning accomplishments. Negate by design the scale and institutional character normally associated with mass housing and expressly distasteful to the participants. Develop sensitive relationships of roof forms and site as well as exploit interest of topographical features by a variety of entrance levels, bridges and ramps. Landscaped open spaces were developed to be usable for recreation and social activities in addition to providing visual relief. Design and engineering concepts sought to exploit the varying topography in order to create interest, identity and articulation to the separate architectural design of the villages, separate functions and vehicular and pedestrian circulation.